Your small business or community now has a website. That's great! It's supremely important that you have a web presence. But, we need to ask you, have you looked at your website on a mobile phone or tablet? The results may surprise you. If consumers need to do a lot of scrolling and zooming in and out to navigate your website, they will probably just leave in search of a mobile-friendly resource. If you sell online, how does the shopping cart process look and feel on these mobile devices? If your website is not translating well on mobile devices, it can cost you sales. Not convinced? Check out this survey from a Cincinatti-based card processor, Vintiv. The group found significant increases during the past year in the number of consumers that research and purchase right from their mobile device, while they are in-store. It's hard to believe that we're making in-store purchases right from our devices! The major increase in mobile shopping is, of course, directly related to the number of people carrying these devices around with them. You'd be hard-pressed to name someone in your circle of family and friends that DOES NOT have a smartphone or tablet. 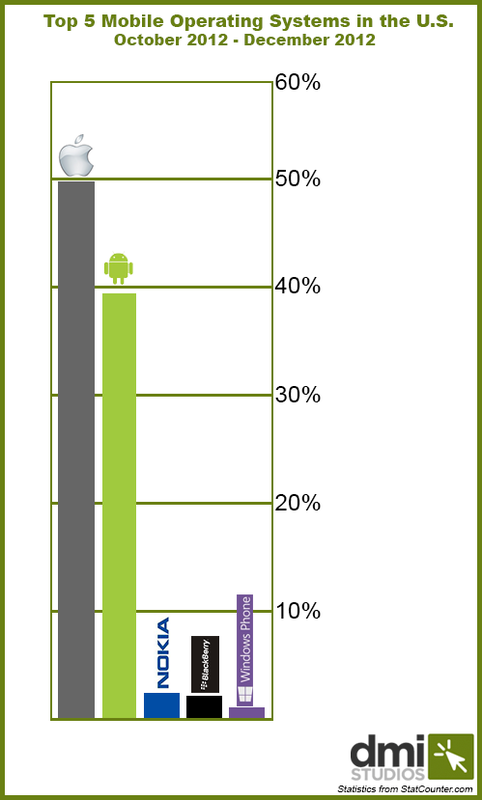 Who is shopping on their smartphones and tablets? We're talking about a major online sales! Goldman Sachs projects that U.S. retail sales directly on smartphones will more than double from $70 billion this year to $173 billion by 2018. Similarly, tablet sales will more than triple from $130 billion this year to $453 billion in 2018. We think you now realize the opportunity in front of you. Just as the major players in retail changed with the advent of online shopping, the major players can once again shift with regards to the mobile experience. How can you move forward? 1. Can Consumers Find You? The first step in many shopping experiences is simply setting foot in your business. When searching on a device, can people get quick and accurate directions to your door? Also, do you offer a sampling of what your business is like? Photos of the great food or product selection can entice shoppers to visit you rather than the competition. 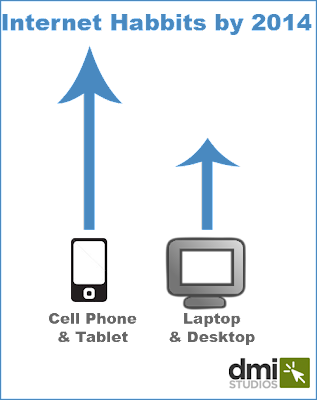 It's time to simply look at your website on a variety of devices. Borrow your friend's Android device and your nephew's iPhone. Conduct a test purchase transaction on an iPad. The ultimate question: Is it a good experience? Easy to navigate. Easy to put items into the shopping cart. Easy to swap out product features? Consumers are looking for enjoyable experiences when they shop. Make. It. Easy. The time to become mobile-friendly is now! While the process seems daunting, it doesn't need to be. The focus is on making the process to buy from you, research about you, or enter your door, easy and enjoyable. 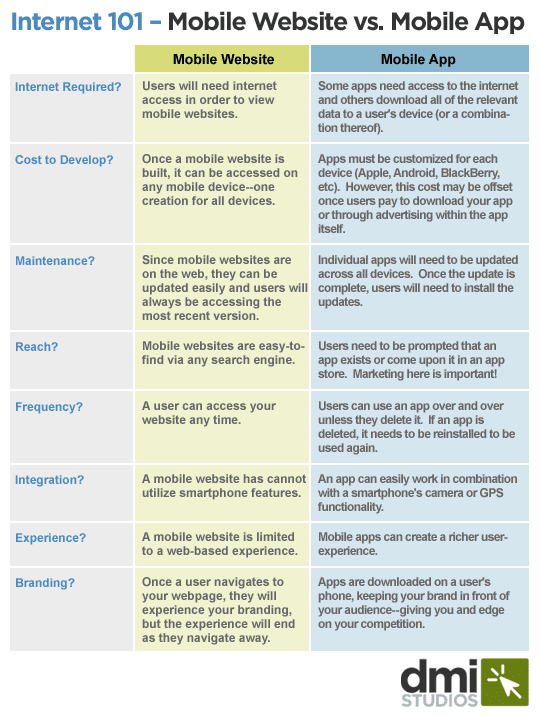 Why Do I Need a Mobile Web Design? Now that we've got you convinced that focusing on mobile (phone and tablet) browsers is in your brand's best interest, what should your next steps be? Before we discuss a mobile strategy, allow us to explain why your website needs to "kick it up a notch". In addition, a mobile website streamlines any processes on your site (say, a shopping cart or form) to be quickly and easily filled out. 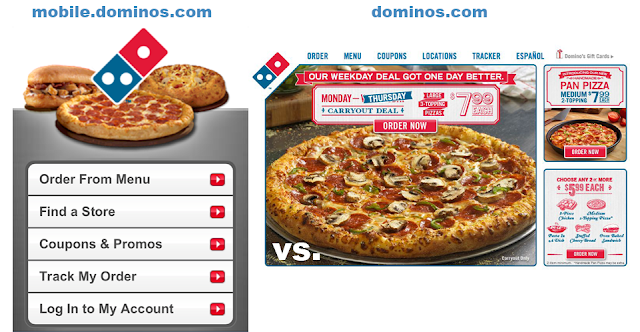 Again, making your site more user-friendly. A responsive design is a "parent" group of programming code , if you will. Once a parent group is created for your website, it can decide how and what content will be displayed depending on the venue. Then, according to how your site is accessed (whether desktop, tablet or cell phone) the "parent" tells the website how it will appear to your visitors--more content and features on larger screens, less content on smaller screens. Does this mean a website redesign? 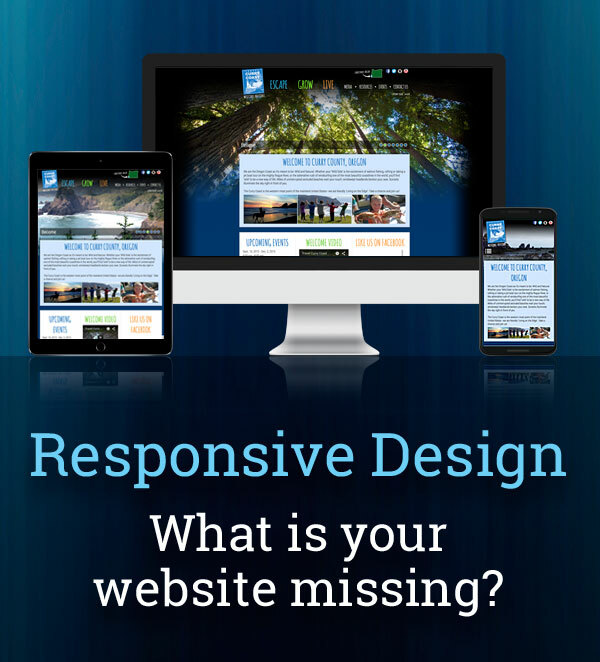 In order to achieve a responsive design, your site needs to be written in HTML5. However, if the look of your site has you smitten, rest assured that it can be the same or similar to what it currently is--taking into account the different viewing sizes of mobile tech. In summary, the backbone of the site needs to be updated, but the look and feel can remain, if desired. Hungry for more details about responsive web design? Check out these 50 examples of great responsive design. We all know we should be paying more attention to mobile internet browsing and it's impact on our business. But, how much more attention should we be giving it? As with any trends, these numbers may change, but it is always nice to know where we're at now. Remember when Nokia was an industry leader in early 2000? As smartphones took over, the company failed to keep up and, for all intents and purposes, dropped off the face of the Earth. It appears they're back and hoping to become a global leader once again. 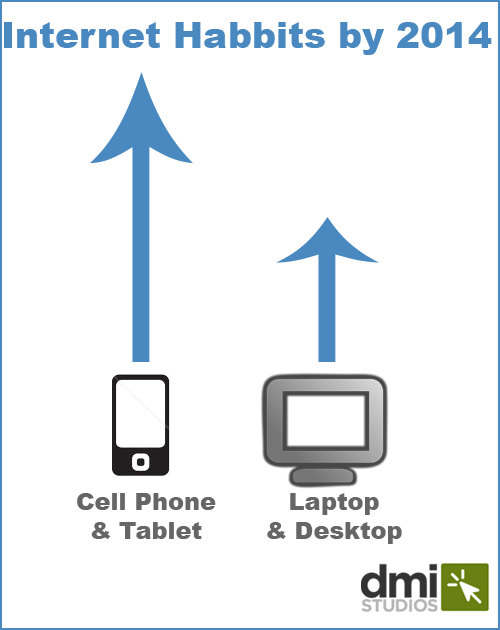 "Mobile browsing" includes tablet devices which, for many, may soon replace their laptops/desktops. Looking at the side-by-side comparison, it appears that mobile browsing only accounts for about 13% of overall online traffic. However, like the explosion of the internet in the 90's, this is simply the infancy of mobile browsing. Morgan Stanley has predicted that, by 2014, globally, mobile internet browsing will surpass desktop search. That would mean exponential growth is on the horizon. 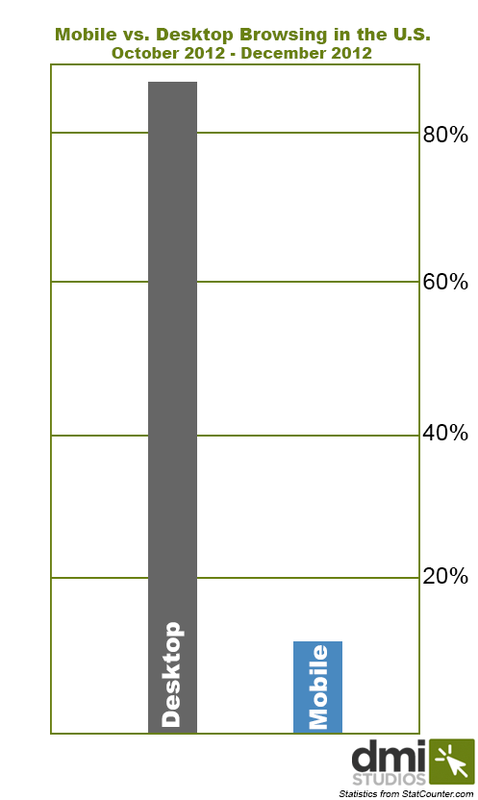 Major shifts occur from time to time in online business. One day, an Amazon.com is born and, the next day, an AOL is forgotten. Mobile browsing represents one such shift. It's time to take mobile browsing seriously. In the next 30 days, we'll be looking at tools, tricks and ideas to help with your mobile internet presence. This post is the first in a series of Internet 101 information topics. As always, when class is dismissed, you're welcome to contact us if you have any questions or would like any additional information. If you don't feel at the head of your class, don't worry, we took notes. Mobile App - An app is a program that is downloaded from an app store onto a user's phone. Apps are typically focused on one task (customer service, social media, entertainment, training, or informational). Mobile Website - A mobile website resides on the internet and your audience can navigate to it through a browser. It is a streamlined for efficient loading and viewing from mobile devices. It can be difficult to determine if an app or a mobile website is best suited for your business needs. Each application has unique qualities that can grant your idea success. In a majority of cases, a mobile website is the best bet for business. However, apps are extremely powerful when used in the proper cases. Just take a gander at the 50 Best iPhone Apps of 2012 by TIME magazine. Are you brainstorming an app or mobile website? We'd love to chat with you about your options! home or away? who's out of the game? long wait at the doctor? why not watch a movie?